I always like to get a new Mac or even just an OS X update. Recently I bought a new MacBook Pro and updated my old Mac Pro to Mavericks. Usually you have to install some software or at least make some adjustments to OS X. You might run into some small problems or have some questions. Then, all the possibilities of Mavericks and it’s apps and utilities can be a bit overwhelming. I’ve listed what I ran into, and what I did about it: OS X Mavericks adjustments. Per default, in OS X Mavericks, the command-alt-space keyboard combination opens a Finder search window, even when you’re working in, say, Adobe Illustrator, trying to use this shortcut to invoke the Zoom-Out tool. Since the Finder keyboard shortcut is global, it overrules Illustrator. If you want to keep access to Zoom Out in illustrator, you can disable the CMD-ALT-SPACE Finder shortcut in System Preferences > Keyboard > Spotlight (or in System Preferences > Spotlight) by unchecking the Show Spotlight box. Although OS X is more versatile than ever, there are still some utilities that I like to have at my fingertips. I’ve been using them for years and I don’t feel ‘at home’ without them. Coming from 10.7, it’s nice to notice that Notes’ content now synchronizes nicely between my old Mac Pro 2008 with 10.9 Maverics installed and of course my iPhone and iPad. This didn’t work as perfectly, like iCal and Address Book did. I normally never use Powerpoint, unless someone sends me a .ppt file. Fortunately, now you get KeyNote for free with OS X Mavericks. It opens Powerpoint files just fine, so you don’t have to install Powerpoint just to work with a Powerpoint file once in a while. I didn’t notice big changes to Mail. It looks exactly the same, except for the color panel button maybe. I had a 20 GB worth of old email messages and attachments and the transition went relatively smoothly. It messed up one mailbox, as far as I can tell. The messages were there but the text of the body wasn’t rendered. Rebuilding it didn’t solve it. Finally I deleted the mailbox and imported it again from a backup BD-R. That solved it. Illustrator has a few weird default settings. I won’t discuss the backgrounds, but it is important to know a few things, to avoid a lot of frustration. First thing I noticed, is that guides are not locked per default. This recipe for problems is easily fixed by the CMD-ALT-; shortcut, or by choosing View > Guides > Lock Guides. I had already set Units to millimeters and Color to RGB when creating a new document but you might want to also set the Unit for Stroke to millimeters in the Preferences (CMD-,) > Units panel. While it’s open, I’d like to set the General > Keyboard Increments to 0,1 mm, or at least something else then the equivalent of 1 point. Same with the corner radius. Then there’s the Brush tool and Pencil tool that loose their color after every stroke. Seriously, who would ever want that?! 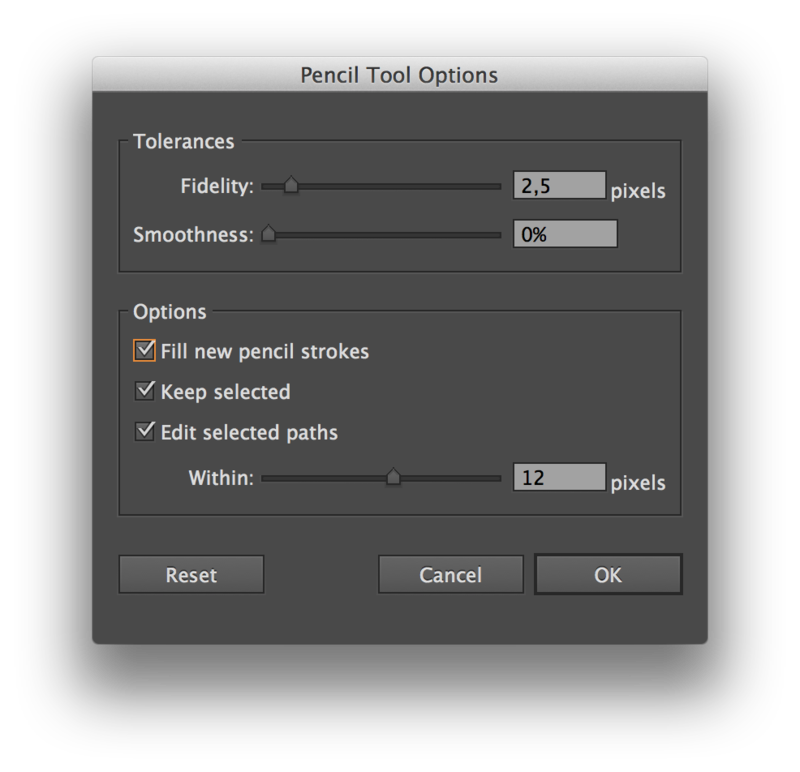 Fortunately this can be fixed by double-clicking the Brush tool and Pencil tool icons and choosing ‘Fill new pencil strokes’. 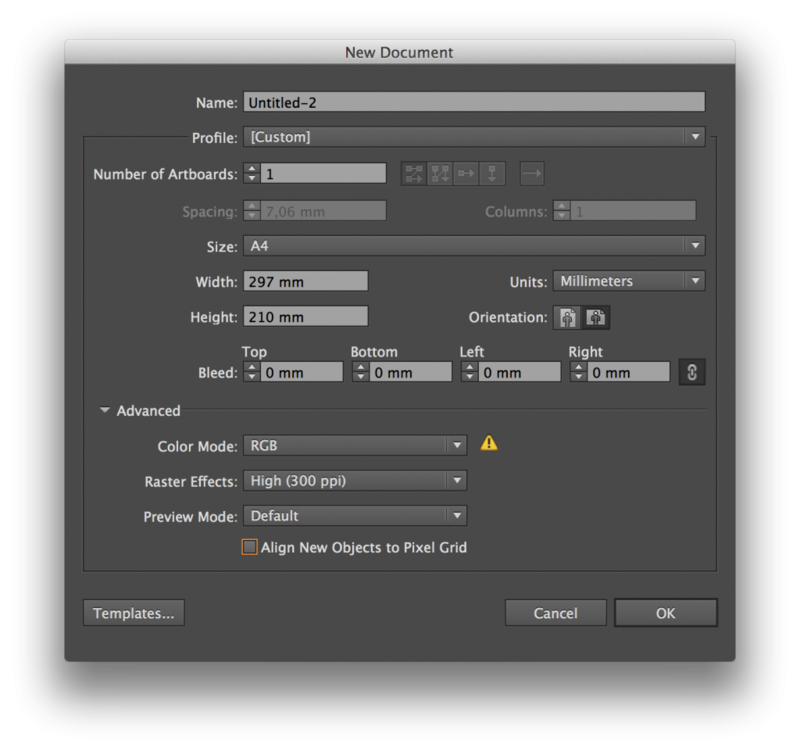 You can only activate or deactivate the Align New Objects to Pixel Grid option when creating a new document via a checkbox. You can switch it on and off for selected objects in the extended part of the Transform panel, but once the document has this option activated at creating, you’ll have to de-activate it for every new object! The Smart Guides option (CMD-U to toggle it off and on) is not for everyone, but I like it. Sometimes it won’t snap to anchor points though, even when they are right under your mouse cursor. Hold down the Command key and voilà, suddenly the object that you are dragging snaps to the anchor point. Don’t ask why it’s so broken, just be happy you know the fix now. I have often wished for a shortcut to force application windows into a grid, like text columns in magazines or newspapers. Of course you can do it by hand, but it is cumbersome and strains your wrists. It turns out that there are about half a dozen apps that can do it for you. Most of them just put your windows in half and quarter screens. For a lot of users apparently this is enough. On a WQXGA monitor resolution though, I found this is still quite a large chunk of screen, so I looked for a window snapping app that could do better. I tried a few window snappers. BetterSnapTool was the second best. It let’s you set up your own keyboard controlled templates of window positions / sizes, anywhere on the screen. Optimal Layout tops this by offering an adjustable screen grid. This grid is an easy way to quickly and exactly assign a square portion of the screen to a window. Besides the default ‘left half’ and ‘right half the screen’ shortcuts, I created a set of 8 templates that together split op the screen in a grid of two rows and four columns. It took some time to find 8 unused ‘global’ keyboard shortcuts for them, that didn’t interfere with shortcuts I already used in other applications. Finally I settled for CTRL-1 to 8 and CTRL-ALT 1 to 3 for the default ‘whole screen’, ‘half screen’ and ‘center 50% column’ shortcuts. CTRL-ALT 2 toggles both the left and right half of the screen, saving a keyboard shortcut. 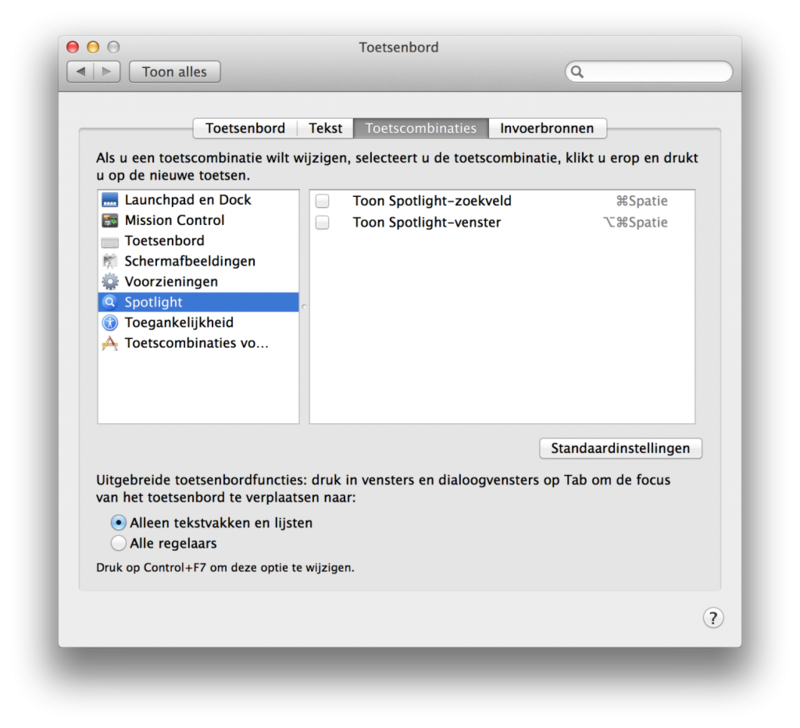 It is surprisingly easy on the eyes to use templets for the positions of windows, especially of Finder Windows. Small windows don’t work well because I want to see more than just the names of the files in column view, so I use half screen Finder windows, but in combination with the new Mavericks Finder Tabs. This way I can browse very long lists of files easily, drag them across folders, change between lots of folders quickly (using the side bar menu) while still having only two windows open. Text Editor is the default application for text files, but it’s not very powerful or cool for that matter. I often use Sublime Text because it has all the features I need and like. It comes with a bunch of color schemes for example. Syntax coloring doesn’t only look good, it also makes it easier to find what you are looking for, because you only have to focus on the color that – for example – variables are shown in. I also like the way it shows a miniature of large texts on the side, that you can use to scroll fast while keeping some notion on where you are. It’s much like the photoshop miniature feature.